Area monitoring without limits - the Drager X-zone 5000. In combination with the Drager X-am 5000, the X-zone 5000 reliably monitors for up to six hazardous gases and warns at preset levels. This easily transportable, robust and water-proof unit extends mobile gas detection technology to a unique system with many applications. INNOVATIVE AREA MONITORING - The Drager X-zone 5000 transforms the Drager X-am 5000 personal gas detection instrument into an innovative area monitoring device for a wide range of applications. A patented combination for increased safety - used with personal gas air monitoring carried on the body or positioned where gas hazards are expected, the X-zone 5000 area monitor knows no limits! CLEAR ALARM - 360° - Even from a distance, the illuminated green LED ring indicates that the air is free of toxic and combustible gases. When gas hazards are detected, the LED changes colors from green to red, providing a clear visual warning that hazardous gas is present. In addition, it emits a loud and audible evacuation alarm. With a patented 360° alarm amplifier, the acoustic warning is heard easily over a wide area, independent of wind direction. 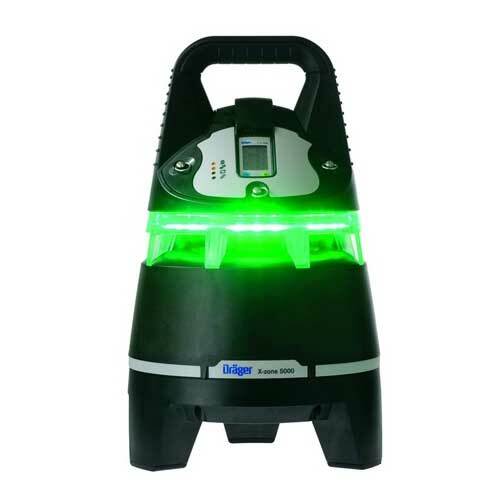 The Drager X-zone 5000 gas entry is arranged so that gas can diffuse into the Drager X-am 5000 from all sides. WIRELESS FENCELINE - Up to 25 Drager X-zones can be automatically interconnected to form a wireless fenceline. This interconnection of the monitoring devices allows for rapid securing of larger areas, e.g. leaking pipelines or industrial tanks - or the monitoring required during industrial shutdowns. In the event of a gas alarm, the Drager X-zone 5000 transmits alarm signals to all units that are part of the fenceline which then display a daughter alarm. The original alarming unit shows a red LED along with its audible alarm, while the daughter alarm displays green/red with its illuminated LED ring. This provides fast, easy recognition of the general alarm, while identifying the unit which alarmed originally. This assures a positive alert and a clear and clean evacuation. Alternatively, the fenceline can be wired. AREA MONITORING - USING A SAMPLING PUMP - An optional integrated pump allows monitoring of remote areas by pulling a sample to the device. This provides continuous monitoring of confined spaces and locations which are difficult to access - from a distance of up to 45 m (150 ft). ALARM CONTACT FOR CONNECTION TO EXTERNAL EQUIPMENT - Via the potential-free alarm contact, the Drager X-zone 5000 device can be connected to and operate external equipment such as alarm horns, lamps or traffic lights. In addition, the fenceline signal, along with the alarm contact, can be forwarded to a control room - overseeing a wide range of applications. AVAILABLE FOR USE IN CLASS I, DIV 1 OR ZONE 0 AREAS - Unlike personal gas detectors, area monitoring devices often stay located within a potentially hazardous area, even during a gas alarm. It is therefore important that the devices are approved for use in explosive hazard areas. The approvals for X-zone 5000 enable the continuous operation of the device in an explosive atmosphere and environment. CONTINUOUS OPERATION FOR UP TO 120 HOURS - Two different types of rechargeable batteries enable the Drager X-zone 5000 to be adapted to a variety of applications: the 12 Ah battery unit weighs about 7kg (15 lbs) and offers continuous operation for up to 60 hours. The alternative 24 Ah battery provides up to 120 hours of continuous operation - a complete working week. INDUCTIVE CHARGING TECHNOLOGY - The Drager X-zone 5000 can be charged in two ways: in the conventional wired manner or via a modern wireless induction charger. With the inductive charge cradle, the device is simply placed into the charger - alleviating the problems encountered with dirty charging contacts, etc. Additionally this non-contact charging possibility also allows maintenance and service to be carried out simultaneously. CONFIGURABLE TO MEET INDIVIDUAL REQUIREMENTS - With the Drager CC-Vision PC software, the Drager X-zone 5000 can be configured to meet individual needs and requirements. Alarm volume, visual cadences and frequency can all be adjusted. In addition, X-zones can be grouped to work as teams, so several groups of units can be set up to monitor different areas in close proximity without interfering with each other.